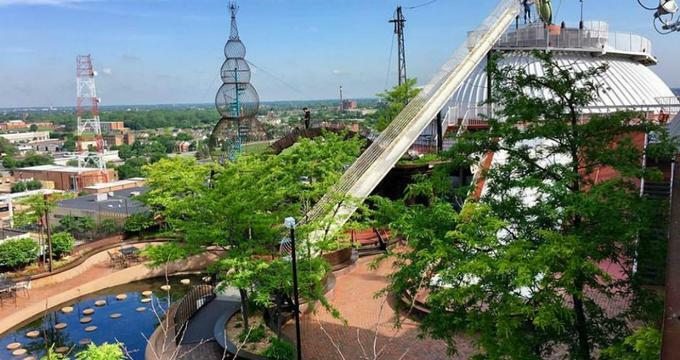 Located in the Washington Loft District of St Louis, City Museum is an award-winning avant-garde attraction that draws hundreds of thousands of visitors each year. The museum consists of four floors of exhibit space spanning 600,000 square feet. Considered by many as a surrealist exploration of found objects, it is part museum and part playground. Many of the objects incorporated into the architectural collage of the building have cultural or historical significance for the city of St. Louis. This singular attraction brings to light both the tensions and opportunities inherent in a city landscape. City Museum first opened its doors in 1997, 4 years after Bob Cassily bought the property with his wife Gail. The structure’s original purpose was to house the International Shoe Company factory and warehouse. Due to its immense popularity, the museum has grown to include new attractions over the years. The first such expansion took place in 2002, with the addition of the MonstroCity exhibit. The following year, the Enchanted Caves and Shoe Shaft was added. The year 2004 saw the addition of the World Aquarium exhibit. Upon entering the museum, visitors are plunged into a world of aquatic sculptural mastery. Framed by mosaic floors and columns, the space features sculptures of fish, mermaids, and other fantastical sea creatures. The exhibit blends fantasy and reality by incorporating a real 5,000 gallon aquarium, which is home to various species of fish and turtles. Those hoping to rent the space will also find a triple level tree stage, a dance floor as well as seating for approximately 100 people. This exhibit is a giant jungle gym containing many levels, caves, and climbs. The purpose of this space is to explore and play. To this end, there are ball pits of various sizes as well as slinkies through which visitors are invited to crawl. The focal point of the room, if one had to pick something, would likely be the two aircraft fuselages suspended from the ceiling. True to its name, the Vault Room features double vault doors. To add to the bank vault theme, its walls are lined with safety deposit boxes. A Versailles-inspired hallway of mirrors, a myriad of St. Louis relics as well as a marble bar are just a few of the features that visitors will encounter in this area of the museum. This 19th century log cabin that was once the home of Daniel Boone’s son was added to City Museum’s roster of exhibits in the 1990s. The museum purchased it from the Hezel family, who owned the structure for more than 100 years. Featuring a spacious brick patio overlooking the MonstroCity exhibit space, visitors are invited to sit and socialize in this repurposed pioneer structure. Architecture Hall is an event space adjacent to the Architecture Exhibit at City Museum. This exhibit was curated by Bruce Gerrie and features a variety of salvaged architectural pieces. The hall has a dance floor and a turn of the century bar, which offers an elegant backdrop for evening functions. One of the most unique features of City Museum is its adjacent shoelace factory. An homage to the building’s original purpose, the factory now produces colorful shoe laces available for purchase by museumgoers. Samwiches in the City is a restaurant located on the mezzanine level of the museum. This small eatery features gourmet sandwiches made from artisanal breads, St. Louis-style brick oven pizzas, and much more. Despite using high-brow ingredients, the menu is kid-friendly and can be adapted to suit some dietary restrictions. The Baby Elephant Café offers a perfect counterpoint to Samwiches in the City. Located on the third floor of the museum, it offers carnival fare such as hot dogs, cotton candy, and popcorn. Available exclusively during the summer months and weather-permitting days, the Roof Top Cantina offers an unparalleled dining experience. Focusing on authentic Latin American fare, the Roof Top Cantina has delectable tacos, pico de gallo, nachos, and fresh guacamole. Visitors of drinking age are invited to try its original cocktails. Here, visitors can be seated under the museum’s rooftop Ferris wheel while enjoying sunset views of the city of St. Louis. Finally, for those seeking a hearty home-style meal, Grill Master Tony’s delivers delectable St. Louis specialties, such as the always-popular mango BBQ ribs.